A journey in the Algerian Sahara is a fascinating experience. 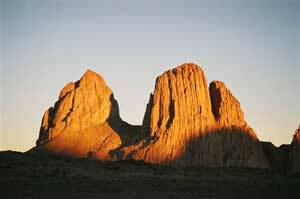 You arrive by boat and then motor in a four wheel drive or alternatively by air to Algeri- Tamanrasset. However you get there, Taman is a enchanting town of the Sahara. To the North East there are the red peaks of Hoggar and to the South East there is the emptiness of the sandy desert which a thousand kilometres away creeps into Niger and Mali and westward to Mauritania and Morocco. For those of us that are fascinated by the desert landscape and love climbing, the red granite "Dolomite" peaks here make the area one of the most interesting in Africa. Guided by the friendly Tuareg who look after us not least by cooking their incredible food over campfires our roaming across the desert of sand and stone seems almost unreal in terms of time and space. One cannot talk of this area without mentioning the writer and alpine guide Roger Frison-Roche who discovered the region and its beauty. Encouraged by his stories of adventure, we cannot avoid to climb "Garet el Jenoun" also known as the mountain of the spirits (which even today the Tuareg are afraid of) and visit the rock paintings of Mertoutek which are a thousand of years old. In the period we spend climbing in Hoggar, we stay in an isolated place called Assekrem which was created by Father Charles de Foucauld. The people who give us hospitality here are followers of the great Father and are a source of information at the close of each day. There is so much to occupy our minds in this place of nothing - not just the climbing, the magic of the desert and the mountains but also the chance to dream a little.